Have you ever seen kitchen countertops made out of bamboo or recycled paper? Innovators in the home improvement market are constantly trying to create interesting products to attract new customers. As such, they have invented some kitchen countertops made of unusual materials. These products are definitely not as affordable or accessible as traditional materials, but it's good to see that people are thinking outside the box and making an effort. What is the attraction behind these different materials for kitchen countertops? The short answer is that consumers like having something unique. For now, however, we can expect most homeowners to stick with natural stone materials like marble and granite for their countertops. 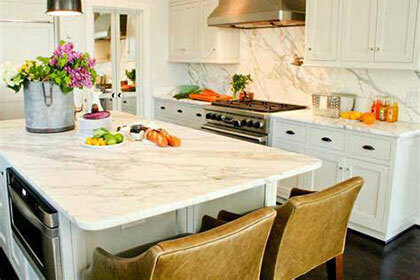 Quality marble countertops bring elegance and style instantly to kitchens and bathrooms. Quality marble countertops are luxuriously smooth, and that distinctive feeling of silkiness makes working on them a pleasure. In terms of durability, marble wins hands down over vinyl and wood, both of which are prone to being dented by heavy cookware or nicked by knives. If you're into entertaining, a kitchen island with a marble countertop and matching bar stools will allow you to do so with class and style. Marble always conveys an impression of elegance, whether it's used in a modern kitchen, a classic kitchen, or a restored farmhouse kitchen. To dress up your marble-topped kitchen island, you need nothing more than a few candles to create a perfect ambiance. Prev: Quartz Countertops: The New Contenders!